Stunning and rare Mid-Century Modern pendant light. Striking Italian design from the 1960s. Bronze and metal pendant with original Murano glass shade. All five pendants are in very good condition, shades are not broken or chipped! Price is per item. A Classic and highly desirable form with a transparent wavy line that wraps around the predominantly white globe. There are several available. Beautifully elegant Murano glass pendant light, 1960s. A one-of-a-kind unique piece, a truly exquisite lighting statement in good original condition. 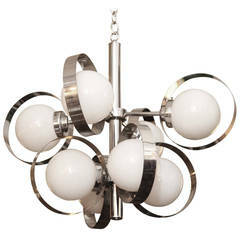 Italian Mid-Century Modern chrome and white glass fixture from the 1960s. This item can be viewed at our 302 Bowery location in Manhattan. 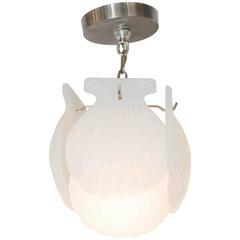 Pendant lamp with opal glass shade, Italian, 1960s Original condition. Murano glass hanging pendant, 1960s. Recently rewired. 1960s Mid-Century Modern pendant hanging fixture with chrome detail and textured waffle glass. This has one single socket. This can be seen at our 302 Bowery location in Manhattan.